Defending 6A champion Blue Valley North will go on the road to take on a Sunflower League opponent for the third consecutive week when the Mustangs battle Olathe North at the Olathe District Athletic Complex (ODAC) on Friday. In the past two weeks, Blue Valley North has defeated Shawnee Mission South 56-21, and last week eliminated top-seed Gardner-Edgerton, 49-28. The Mustangs have won eight consecutive games since beginning the season 0-3 will losses to Bishop Miege, Blue Valley, and Pittsburg. In last week’s win over Gardner-Edgerton, senior quarterback Graham Mertz passed for 282 yards and threw six touchdown passes to lead the Mustangs to victory. Despite playing in only nine games this season, Mertz, a Wisconsin commit, has completed 63 percent of his passes for 3,132 yards and 44 touchdowns against only eight interceptions. By comparison, Mertz passed for 3,684 yards and 45 touchdowns with six interceptions in 13 games last season. The Mustangs offense is explosive and can seemingly outscore anyone. Blue Valley North rushed for only 26 yards on five attempts against Gardner-Edgerton. Amauri Pesek-Hickson has been the Mustang’s primary ball carrier this season having rushed for 814 yards and seven touchdown son 95 carries. He has also caught 44 passes for 725 yards and 13 scores. Wideout Cameron Burt has had a remarkable season, and set the state record for receiving yards in a single season with 1,576 surpassing the mark of 1,548 set by Prestyn Atherton of Sunrise Christian back in 2011. Burt has 87 receptions on the season and 19 touchdown catches, and could challenge for the single-season records for receptions (98) and receiving touchdowns (23). Olathe North avenged a regular-season loss to Shawnee Mission East by scoring a fourth-quarter touchdown to eliminate the Lancers, 24-21. Senior back Daymonn Sanchez rushed for 258 yards and a touchdown on 39 carries in the victory. Arland Bruce, IV added 134 yards on the ground and two scores on 25 attempts. For the season Sanchez has rushed for 2,175 yards and 28 touchdowns on 242 attempts. Sanchez has rushed for nearly 3,500 yards and 42 touchdowns in his high school career. Bruce has added 1,275 rushing yards and 19 scores this season, while passing for 1,024 yards and 11 touchdowns. Still just a sophomore, Bruce has already rushed for 2,094 yards and 24 touchdowns in this career. You get the feeling that both offenses can have success in this matchup, albeit in different fashions. The game may ultimately be decided by which defense can step up and force a turnover or get a timely stop. Junior A.J. Patillo leads the Eagles with 94 tackles, including six for loss and four sacks. The Eagles have 10 interceptions on the season with Devin Stoker and Mario Sanchez each grabbing four. Stoker is second on the team with 87 tackles. Manhattan will travel to Derby with the winner advancing to the Class 6A state championship game at Emporia State’s Welch Stadium. Top-ranked Derby withstood a good start by Topeka High to advance with a 38-7 victory in last week’s quarterfinal. Topeka High led 7-0 after the first quarter and had a chance to add to that lead, but Derby’s Migc Aiyanyor blocked the Trojan field goal to keep the Panthers within one score. Derby would eventually score on the ensuing series with a touchdown pass from Hunter Igo to running back Tre Washington to tie the game. The Panthers added a field goal to lead 10-7 at halftime, then reeled off four more unanswered touchdowns in the second half. Igo and Washington each rushed for two scores in the second half as the Panthers pulled away. Washington rushed for 166 yards on 20 carries, while Igo added 125 yards on the ground on 18 attempts. The Derby defense, which at one point was threatening the state record for fewest rushing yards allowed in a season, limited Topeka’s exceptional three-headed backfield of Jacqez Barksdale, Da’Vonshai Harden, and Ky Thomas to a combined 160 rushing yards on 42 attempts. Derby’s stout run defense will be needed again this week as Manhattan comes calling with senior back Kevontae McDonald. McDonald has rushed for 1,582 yards and 30 touchdowns on 227 carries this season. Last week in Manhattan’s dominating 41-19 win over Lawrence Fee State, McDonald carried 35 times for 237 yards and six touchdowns. Indian sophomore quarterback Dane Aschenbrenner has been able to keep opposing defense honest with the passing game, but has also added 568 rushing yards this season. Manhattan will look to ride their defense which has held opponents to 134 total points this season – second only to Derby’s 81 points allowed. Last week, the Indians completely shut down Free State in holding the Firebirds to 87 yards of total offense. While that’s unlikely against Washington, Igo, and the rest of the Derby offense, Manhattan will need a strong effort and play an errorless game in order to advance. There are few storylines better than Olathe West’s improbable run to the state semifinals in their first season as a varsity program. The Owls finished a 2-6 regular season and have since won three straight playoff games against KC Washington, KC Schlagle, and De Soto. Now comes the ultimate challenge. The Owls will have to take down the top-ranked team in Class 5A and one of the top teams in the state in St. Thomas Aquinas. Olathe West advanced to the semifinal round with a 24-7 victory over De Soto. The 11-seeded Owls scored in each quarter in winning beating the Wildcats. Gavan McDaniel rushed for a 141-yards and two touchdowns, while quarterback Zac Krause passed for 106 yards and a score. For the season, Krause, the transfer from Olathe North, has passed for 1,854 yards and 17 touchdowns. Krause’s primary receives continue to be Connor Delong and Caden Barnard. Delong has 46 receptions for 666 yards and seven touchdowns, while Barnard has 38 catches for 521 yards and two touchdowns. Meanwhile, McDaniel’s performance on Friday solidified his legacy as the first 1,000-yard back in Olathe West school history. McDaniel has rushed for 1,074 yards and 10 touchdowns on the season. He’ll likely find difficult sledding against an Aquinas defense that completely shut down the Mill Valley run game in two meetings this season. Aquinas limited the Jaguars to negative 27 rush yards on 44 attempts in their two meetings. The Saints defeated the Jaguars 30-7 last week after a 24-13 victory earlier in the season. Aquinas built a 27-0 lead and cruised behind Tank Young’s 136 rushing yards and two touchdowns. Quarterback Tate Raboin also passed for 141 yards and two scores for the Saints. On the season, Young has rushed for 1,743 yards and 22 touchdowns, while Cameron Jackson, a Kpreps all-state selection a year ago, has 526 yards and three scores. Raboin has kept defense honest by passing for 874 yards and 12 scores. This week the St. Thomas Aquinas football Twitter account noted the first ever touchdown in school history occurred on a touchdown pass from John Seibolt to Jay Novacek in a freshman game. Seibolt’s son, Max, plays for Aquinas, while Novacek, now the Olathe West principal, has a son, Jackson, that is a junior for the Owls. One of the teams will end a long state championship game drought. Maize has never made a state finale and is in the semifinals for the second time, first since 1990. Northwest reached the semifinals last fall, its second-best finish in school history, and suffered a heart-breaking Class 6A loss to Derby when it outgained the Panthers. The Grizzlies have one state finale, a runner-up in 1996. The teams match 5A’s No. 1 offense and No. 1 defense. Northwest has averaged at least 50 points a game the last three seasons and has tallied 57.4 points a contest this year. The Grizzlies have permitted 24.7 points per game. Last week, Northwest had one of the highest scoring games in state history with an 84-67 victory against nearby rival Bishop Carroll. Maize has scored 38.3 points a contest and permitted just 9.6. Northwest’s average margin of victory is 32.7 points a contest, Maize slightly behind at 28.7. Northwest has a slightly better strength of schedule, according to Prep Power Index. The Grizzlies stand at No. 8, Maize at No. 12. Both squads have plenty of star power on both sides. Maize quarterback Caleb Grill, who officially signed with South Dakota State for basketball this week, has set a school record with 2,601 passing yards and is one of the state’s best punters. Caden Cox has 1,019 rushing yards. For Northwest, junior quarterback Reagan Jones, a first-year starter after he transferred from Andover Central, has thrown for 2,060 yards with a 28/4 TD/INT ratio. He has set the school record with 28 passing touchdowns. Three players have exceeded 1,000 yards for a team that has rushed for 387 yards a game. Senior Breece Hall, an Iowa State commit, has rushed 179 times for 1,865 yards and 25 scores. Senior Roy Johnson has 136 carries for 1,016 yards with 14 TDs. Jones has 121 carries for 1,103 yards and 17 rushing TDs. In last week’s shootout victory over Bishop Carroll, Northwest attempted only six passes. The Grizzlies rushed for 690 yards and 11 touchdowns in the game led by Hall’s 366 yards and six scores on 32 attempts. Jones added 200 yards rushing and three touchdowns, while Johnson contributed 124 yards and two scores. Senior Josh Carter again leads the defense with 113 tackles and has 15 TFLs. Oklahoma commit Marcus Hicks has a team-high 24 TFLs. Maize’s only loss came against Derby, an offense that averages 48.2 points a contest. Maize played the Panthers close late in a 35-21 loss in Week 8. 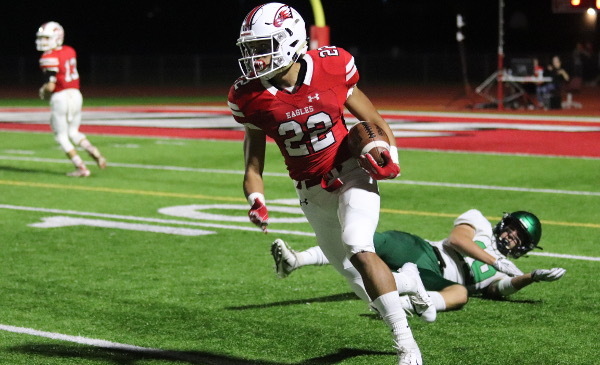 Last week, Maize had to hold off Great Bend late, 28-21. Northwest beat the Panthers, 56-34, in Week 3. Maize’s great strength has come on key downs. Even last week, Great Bend passed for 310 yards and ran more plays than the Eagles. However, Maize limited Great Bend to 6 of 19 on third/fourth down. This season, opponents have converted 23.6 percent of third downs and 27.5 percent of fourth downs versus Maize’s defense. Teams have averaged 5.1 yards per pass attempt and 3.8 yards per rush. Derby had 546 yards (390 rush) versus the Eagles, but Maize held the Panthers to a combined 8 of 20 (40 percent) on third/fourth downs. This is the first matchup between the teams since 2007, when Northwest defeated Maize, 52-21, and the seventh all-time meeting. This marks the first occasion the squads have matched up in the playoffs. While many believe Northwest – the West favorite all year – will win, Maize has the quarterback and defense to match the Grizzlies. Northwest is the favorite, but expect a much closer game than the conventional wisdom.